Rope Access is the safest and most affordable access system to complete work at-height, in confined spaces and in subterranean environments via rope. It was initially developed from techniques that were used in climbing and caving. At Mekanchi Global, we chose Rope Access as it is the most innovative solution putting you at an incredible professional advantage, reaching places where scaffolding and binoculars cannot. It combines the access, labour, rescue, environmental controls, and set-up/take-down in ONE complete system, for ONE total cost. Talking about Scaffolding specifically, the time and labour that is required to build scaffolding makes it an ineffective solution when compared to rope access. Choosing scaffolding would mean paying for a crew to set it up and then to complete any work. The cost to your business is therefore increased by the cost of supply and erection which does not occur with rope access. Additionally, rope access does not require a large amount of space at ground level as is needed with scaffolding. 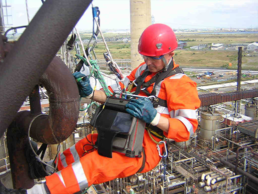 Rope access can be set up quickly and also removed at the end of every working day. This makes it a great option for building surveys on commercial buildings with a large footfall or residential properties. How does Rope Access save you money? 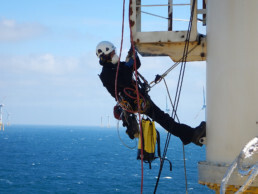 How does Rope Access save you time? Time is always on your side while you choose rope access that too with Mekanchi. The efficiency of our access system is what our clients appreciate. We are one of the best in meeting project deadlines. With minimum set-up time involved, we get the job done right away. Need a job done quickly assuring the safety of people and the process? Mekanchi is the answer. So, if you are looking for a cost-effective way to use your maintenance budget for a building survey or other maintenance work you will most likely benefit from, we are here for your help!